And now, after the hollyday season (in fact, it arrived during the hollyday season), we have a new game for you. This time, a blast of the past and, if I’m understanding well the several title screens (’cause they are many!) this is a game written in 1990 for the NES. 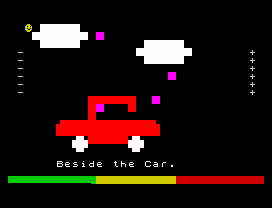 How the programmer managed to pack a NES game in a .sna file and how a ZX Spectrum emulator can run it remains a mystery. But who am I to break the magic? Something it’s true: the game really does look like a console game, with a lengthy animated introduction (which can’t be skipped, maybe you have to plug in a NES controller and press START, but I couldn’ t make the sucker fit in the computer port no matter how hard I pushed) and colourful menus. The fact that you have your options displayed on a tiny scroller and that you actually have to wait to know which key you need to press to actually start the game, adds nice crap factor to the title. Or, at least, it adds suspense. The game revolves around the revolutionary concept of wandering around finding pink squares. If you step on a square which isn’t pink or black, the quite unforgiving game throws you back to the title screen. It also has a timer which you can only refill if you get 20 pinkies. Nasty, innit? You can redefine keys and do some menu stuff in the menu, and I could save some time telling you which keys to press, but I’m not.